There’s a sweet season when there seems to be little difference between spring and early summer, usually mid-May through early July. The wildflowers are fresh, skies are sharp and as snow melts glacier lilies and avalanche lilies almost run over each other in their urgency to bloom. There’s no date set in stone for this magical season as weather, geology and elevation all play a role in creating these fleeting gardens of Eden before the haze of forest fires blunt the landscape and the meadows begin their poignant transition from green to brown later in the year. 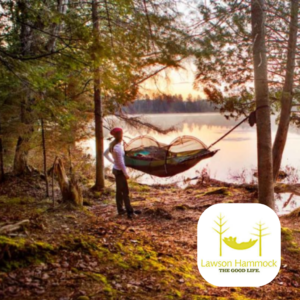 But these are some of my favorite spring hikes and they might be perfect for you right now. 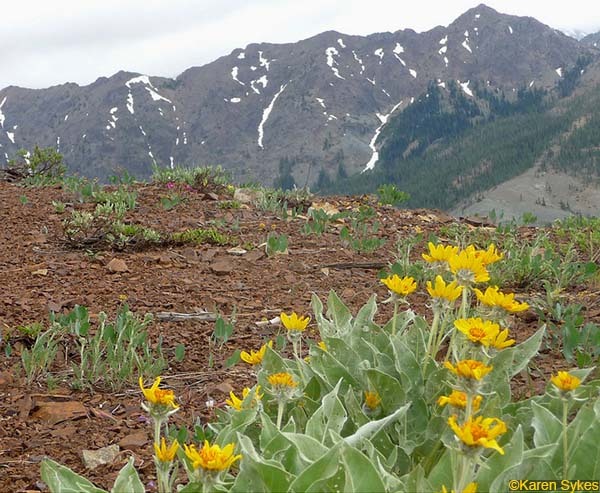 This inspirational season can also be frustrating for hikers; sunny skies and wildflowers often lure us onto higher-elevation trails a little too early – before the snow has had time to melt. Just about the time you think you’ll get within reach of your destination you’ll run into a wall of snow or a snowy chute with poor run-out requiring an ice axe or foolhardiness. You, the eternal optimist, have left your traction devices at home. Mother Nature must laugh at us as we eagerly hike to that first wildflower-studded meadow only to encounter clouds of mosquitoes instead. In spring, creeks are often dangerously swollen so what’s a hiker to do? Sometimes you just have to gather as much information as you can beforehand and gamble (always have a “Plan B” in case conditions keep you from hiking to your destination of choice). Remember, ideal conditions cannot be guaranteed; it is up to you to contact the appropriate land-management agency for up-to-date trail/road conditions, to have the correct map, be equipped and prepared for conditions you may encounter. Especially during the spring thaw over there can still be risk of avalanches in the high country. Below are some of our favorite late spring Washington hikes, early summer hikes with the focus on photography without much risk to life, limb and happiness. The trails described here were hiked in May, June and early July of 2012 (conditions have certainly changed over the winter). Get out your Mount Stuart map (Green Trails No. 209) and choose from a variety of trails in the Teanaway. 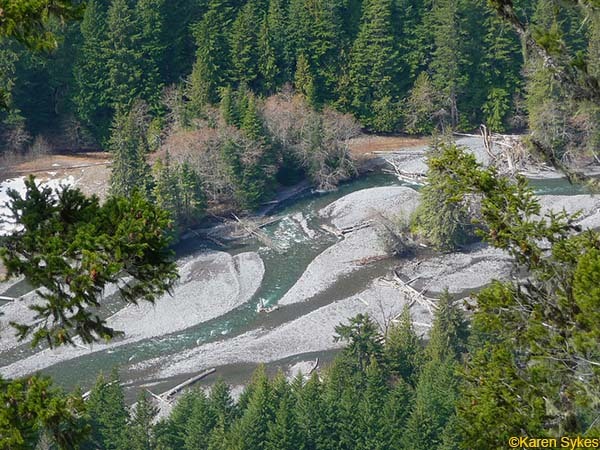 The Jungle Creek/Way Creek trail loop is a May through June favorite though you may have to walk part of the Jungle Creek Road to get to the trailhead due to a road washout. The trail starts off in pine-scented forest, crosses Jungle Creek a few times before it climbs through wildflowers and flowering shrubs to a sunny ridge with views of the Mount Stuart range and other Teanaway peaks. From the ridge hike either direction – turn right for the Johnson Creek trail which descends to the North Fork Teanaway Road No. 9737 or head left about a mile to the Way Creek trail junction for a loop back to the Jungle Creek Road; the Way Creek trail is steep and sometimes used by motorcycles and mountain bikes. You can also continue further along the ridge to mysterious Malcolm Mountain (which I have only managed to find once). Trail junctions may not be signed; trail numbers may have also changed over time and may not correspond to your map. Enjoy the sweetly-scented service berry with its fat, white blossoms not only along the Way Creek trail but along the Jungle Creek Road. Getting there: From Seattle head east on I-90 and get off at Exit No. 85 then go east (right) onto Highway 970 and in about 7 miles turn left onto Teanaway River Road. Continue about 13 miles to a road junction just past 29 Pines Campground (where pavement ends) and Forest Service Road No. 9737 begins. The Jungle Creek Road takes off at that junction (turn left onto Jungle Creek Road); continue until you reach a road barricade (due to a wash-out) or the trailhead. Stats: The loop is about 7 miles round trip (including walking the road), about 2,000 feet elevation gain. For additional information contact the Cle Elum Ranger District (509-852-1100) and listen to their recorded on road and trail updates (including current snow-levels). By mid to late June you should be able to hike the Boulder-DeRoux Creek trail to Gallagher Head Lake. The trail begins off the North Fork Teanaway Road (FS Road No.9737). Though Gallagher Head Lake is in a beautiful setting there is also a road that comes in to the lake from another trailhead used by 4 X 4’s and motorcycles. Solitude cannot be guaranteed – best go early enough there are still lingering snow patches. You can also hike to Koppen Mountain from the DeRoux Creek trailhead. The trail junction for Koppen Mountain is at about 1.7 miles along the DeRoux Creek trail. An advantage of the Koppen Mountain trail is you don’t have to ford DeRoux Creek. Both trails climb to scenic ridges with views and connections to other trails in the region. Getting there: From Seattle head east on I-90 and get off at Exit No. 85 then go east (right) onto Highway 970 and in about 7 miles turn left onto Teanaway River Road. Continue about 13 miles to a road junction just past 29 Pines Campground (where pavement ends) and Forest Service Road No. 9737 begins. Drive about 7 miles on Road No. 9737 to the DeRoux Creek trailhead (left) just past the horse camp. A Northwest Forest Pass is required. Stats: The hike to Gallagher Head Lake is about 8 miles round-trip, Koppen Mountain about 6 miles round trip. Elevation gain is about 2,200 feet (Koppen Mountain) and Gallagher Head Lake is about 1,600 feet gain. Additional information: For updates on road/trail conditions contact the Cle Elum District (Okanogan Wenatchee National Forest) – call 509-852-1100. We especially enjoy the Johnson-Medra trail which begins just past the Beverly Creek Campground on the North Fork Teanaway Road (FS Road No. 9737). The trail immediately crosses the North Fork Teanaway River on a bridge and the trail soon becomes a perfumed tunnel through wildflowers and shrubs. There are several stream crossings; after the last crossing of DeRoux Creek the trail breaks out of the forest and switchbacks steeply to Medra Pass and views that defy description. Look for colorful arrangements of balsamroot, penstemon and phlox – that is, if you can tear your eyes away from the views of Mount Stuart, Mount Rainier and beyond. Getting to the trailhead: From Seattle head east on I-90 and get off at Exit No. 85 then go east (right) onto Highway 970 and in about 7 miles turn left onto Teanaway River Road. Continue about 13 miles to a road junction just past 29 Pines Campground (where pavement ends) and Forest Service Road No. 9737 begins. Drive about 3-1/2 miles on Road No. 9737 to just a short distance past the Beverly Creek Campground. Trailhead parking is on the right-hand side of the road, the trail (left). A Northwest Forest Pass is required. Stats: 8 miles round trip with about 2,340 feet gain. For road and trail conditions or additional information visit the Cle Elum Ranger District website (Okanogan-Wenatchee National Forest) or call 509-852-1100. We love a good fire lookout hike. This forest fire lookout has recently been reconstructed and June is ideal for a visit. On our visit in 2012 we were spellbound by the wildflower displays –Indian paintbrush, penstemon, bear-grass, phlox and more. Interspersed with the wildflower displays are rock formations that look like they belong in the Columbia Gorge. The lookout is the perfect lunch spot with views of Mount Rainier and the intricate network of logging roads below. Mountain goats have also been spotted here. Getting there: From Enumclaw continue east on State Route 410 and about a long mile past Greenwater turn left onto paved Forest Road No. 70, continue about 7-3/4 miles to gravel Forest Road No. 7030, continue about 8 miles on Road No. 7030 to trailhead parking. Though Forest Road 70 is in good condition high clearance vehicles are recommended. Hikers with beefy rigs can drive to where the trail starts but there’s no space to safely turn around – if you met another car you’d have to back up and the 0.7-mile road between trailhead parking and the trail is narrow without turnouts. Road 7030 is in good shape though narrow with water bars. During the week there may be logging activities. A Northwest Forest Pass is required. Map: Greenwater, WA – No. 238 or USGS Lester. For additional information including current road/trail conditions call the Enumclaw Ranger District at 360-825-6585 or visit their website. When it’s still winter at higher elevations we recommend the Palisades Trail (No. 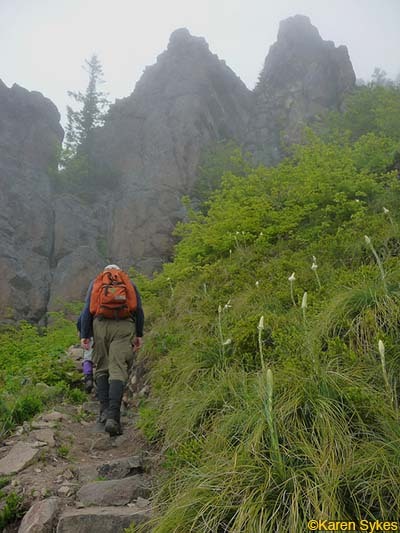 1198), a scenic spring hike with views, waterfalls and wildflowers. Wildflowers grace the moss-lined trail in spring and early summer: bleeding hearts, yellow violets, trilliums, red flowering currant, vanilla leaf, even Calypso orchids (also known as fairy slippers) can often be spotted in the forest. The magic begins on the White River Trail (No. 1199) just off State Route 410 east of Greenwater. Hike 0.1 mile along the White River trail then turn left at the junction with the Palisades Trail. You’ll hear Lower Dalles Falls well before you see it. In spring the waterfall puts on a spectacular display from melting snow. A short spur leads to the base for a closer look. Back on the main trail you’ll climb away from the waterfall toward the Palisades as the trail follows a delicately engineered route between Dalles Creek and towering cliffs. You’ll soon reach a steep staircase that makes quick work of an almost vertical pitch. Above the stairs you’ll cross Dalles Creek – look below (right) for a partial view of Upper Dalles Creek Falls. After crossing Dalles Creek the trail ducks into the forest and in about a half mile reaches the first of several promontories that overlook the White River valley, Sun Top Mountain and foothills (study the map for more options). Getting there: From Enumclaw drive east about 28 miles on State Route 410, park on the left side of the highway (parking is limited), elevation (2,352 feet). The trailhead is just past the overlook of Skookum Falls and is designated with a small sign. A Northwest Forest Pass is required. Map: The map is Green Trails No. 238 (Greenwater). Stats: It is about five miles round-trip to the first viewpoint with 1,100 feet gain. For additional information, rules and regulations and/or current trail conditions, call the Enumclaw Ranger District (Mount-Baker Snoqualmie National Forest) at 360-825-6585 or visit their website just below.